All shop purchase proceeds contribute to the UWM Friends of Art History. 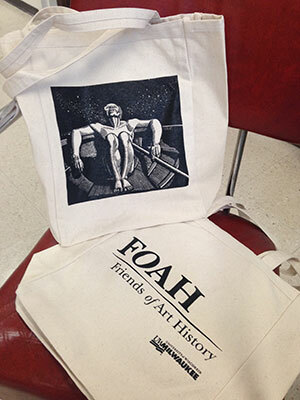 The FOAH funds support the Department of Art History, UWM Art Collection, and UWM Emile H. Mathis Gallery. 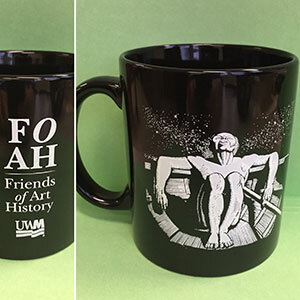 This limited edition mug features a reproduction of Rockwell Kent’s (1882-1971) “Drifter” wood engraving from the UWM Art Collection. This limited edition tote bag features a reproduction of Rockwell Kent’s (1882-1971) “Drifter” wood engraving from the UWM Art Collection. These note cards feature a variety of pieces from the UWM Art Collection. Each set includes 5 note cards bound with ribbon. Cards are blank inside. Purchases can be made Monday-Friday 8-3 PM in person in Mitchell 151 or over the phone at 414-229-4330/4340.